The D'Addario PW-CT-20 Chromatic Pedal Tuner is a cool, pocket-friendly piece of kit that boasts an exceptionally responsive, and highly accurate tuning indicator. Housed in a sophisticated and reliable aluminium enclosure, the tuner is fitted with a 32-bit processor (offering four times the power of a general headstock tuner), which is capable of lighting fast note-detection. The accuracy of the pedal is remarkable, allowing you to get tuned up and performing in next to no time. The True-Bypass design means that when the pedal tuner is activated, your output signal is cut out to eliminate noise. However, when the pedal is inactive, your signal will remain unblemished and unbuffered to keep it pristine. The full-colour vertical display is bright and very easy to read - perfect for dimly lit stages. The pedal can be powered using a 9-Volt battery (included) or by using a 9-Volt power supply. The slim and lightweight design, allows it to slip into your pedalboard, no matter how cluttered it may be. 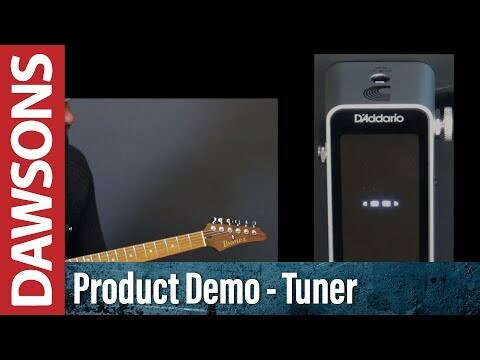 Wherever you are, thanks to the D'Addario Chromatic Pedal Tuner, you can guarantee that your tuning will be as accurate as possible every time.